Web Hosting Services – ORLANDO, FL – Atlantic.Net, a world-class cloud VPS hosting solutions provider, today announced support for Windows Server 2012 R2 operating system with its Cloud VPS Hosting Plans. Windows Server 2012 R2 comes with a new file system, ReFS, and includes dozens of new features, such as IP address management, enhanced user experience, the latest Windows Task Manager, and upgraded server administration for easier cloud computing. The Windows Server 2012 R2 is a great solution for customers needing power and speed to run applications remotely. Atlantic.Net Cloud VPS clients can test the new tools offered by the Windows 2012 R2 operating system and pay via a usage model on a per-second basis, without having to incur upfront licensing costs. 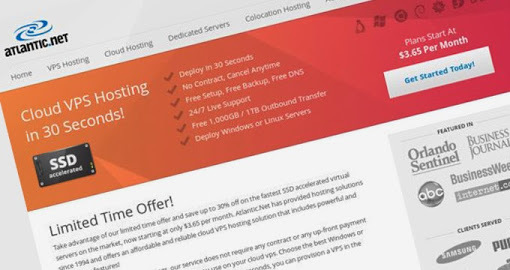 Atlantic.Net’s Windows Cloud VPS Hosting plans start at only $0.0205 per hour (or $14.97 per month), with usage calculated on a per second basis. For a limited time, Atlantic.Net is offering up to 30% off all Cloud VPS plans and 3TBs outbound data transfer included on every server. For more information, please visit http://www.atlantic.net/vps/windows-vps-hosting/. Atlantic.Net is a web hosting provider specializing in offering cloud server hosting, HIPAA compliant and hybrid hosting, private virtualization, and VPS hosting in the cloud. With a range of security certifications and a SSAE 16 (SOC 1) TYPE II (Formerly SAS 70) audited data center that the company owns and operates, the company is also known for its reliability, as dictated by its 100% uptime service-level agreement (SLA). For more information, please visit Atlantic.Net.